Is Juno Therapeutics a Bargain or a Value Trap? Juno's shares slid by almost 20% last month, despite a lack of news. Should investors take advantage of this steep pullback? Shares of the clinical-stage biotech Juno Therapeutics (NASDAQ:JUNO) tumbled by more than 18% in October, according to data from S&P Global Market Intelligence. As Juno maintained radio silence of the most part last month, however, this sizable devaluation appears to be the result of the uncertainty created by the looming presidential election in the United States. 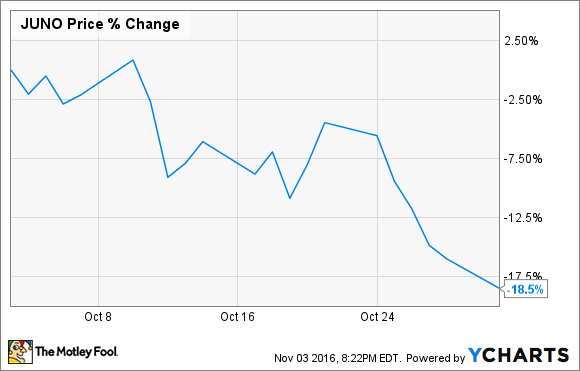 The iShares Nasdaq Biotechnology ETF (NASDAQ:IBB), after all, also turned in a poor showing in October, dropping by 11.5%. Juno is now trading at around 2.5 times its last reported cash position. That's a fairly unusual valuation for a biotech with a robust clinical pipeline chock-full of high-value cancer therapies, and a billion-dollar licensing agreement in place with a top dog like Celgene (NASDAQ:CELG). Apart from the marketwide forces that have been crushing even broad benchmarks like the iShares Nasdaq Biotechnology ETF, Juno appears to be suffering from the lingering safety questions pertaining to chimeric antigen receptor T cell (or CAR-T) therapies in general. Juno's lead CAR-T therapy dubbed JCAR015, after all, was briefly placed on a clinical hold by the FDA earlier this year due to a handful of patient deaths in an ongoing trial for adult patients with relapsed or refractory B-cell acute lymphoblastic leukemia. Adding insult to injury, this clinical hold ruined Juno's chances of leapfrogging its chief competitors Kite Pharma (NASDAQ:KITE) and Novartis (NYSE:NVS) in terms of being the first to bring a CAR-T therapy to market. Kite is reportedly planning on filing a regulatory application for its lead therapy, KTE-C19, as a treatment for patients with chemorefractory diffuse large B-cell lymphoma. Novartis, on the other hand, is making strides toward a regulatory filing of its own with the CAR-T therapy CTL019 as a treatment for children with relapsed/refractory acute lymphoblastic leukemia. Although Juno probably won't win the prize for first to market, there is still hope that the biotech can win best-in-class. And the good news is that investors will get a sneak peak at Juno's next-generation therapy JCAR017 at the upcoming American Society of Hematology meeting this December. All in all, Juno is arguably undervalued based on the overarching prospects of CAR-Ts, as well as the major vote of confidence it received from Celgene via its massive partnership -- despite the well-documented hazards of this first wave of CAR-Ts. Having said that, I'd personally wait until the election is over before buying shares of any speculative biotech stock.